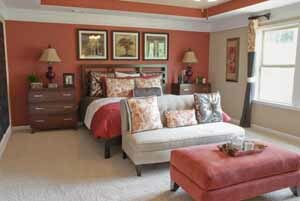 Ashton Woods Homes brings its flair for luxury Atlanta new homes to Suwanee with 45 homes at Belmore Manor. These two-story traditional homes have four bedrooms and 2.5 baths with prices starting in the $220,000s. There are seven energy-efficient, green floor plans ranging in size from 2,516 to 4,500 square feet. Each floor plan also features many different elevations, keeping in line with the builder’s distinctive style. As for the interiors, all homes have 9-foot smooth ceilings on the main level; hardwood floors in the powder room, foyer, kitchen and breakfast area; trey ceilings in master bedroom and dining room; and two car garages. Each home’s gourmet kitchen features maple cabinetry, granite countertops, stainless steel sinks and energy-efficient appliances. The master suites are built to impress with a garden tub, separate shower with a seat, tile floors and walk-in closets. The community is in the North Gwinnett High School district, which means children attend highly rated schools like Riverside Elementary, North Gwinnett Middle and North Gwinnett High. Belmore Manor is also close to Peachtree Industrial Boulevard, one of Atlanta’s main arteries for downtown commutes. To reach Belmore Manor, take Peachtree Industrial Boulevard to Suwanee Dam Road. Turn left on Suwanee Dam Rd. and proceed approx. 2 miles to Price Rd. Turn Right on Price Rd. Belmore Manor is 500 yards on the left. For more information, call Julie Gentry at 770-945-6168.